It seems as if there are several different subtitles to this book – not sure if they are all the same or have minor differences. The one I read on my Kindle was the “365 Days, 524 Recipes, 1 Tiny Apartment Kitchen” version, however the main one for sale on Amazon is the “Julie and Julia: My Year of Cooking Dangerously” version. Everyone keeps telling me how cute the movie is. I haven’t seen it yet, but I just read the book over Christmas. I much prefer to read a book rather than see the movie version anyway. I like envisioning the characters and situations in my mind the way that I want to and when I see a movie based on a book that I’ve read, I’m always disappointed. When I had first seen the trailer for the movie, I thought it looked kind of silly and I had no interest in seeing the movie or reading the book. Well, I got curious. I really enjoyed this book; it was much better than I expected. The way that Julie Powell writes makes it very easy for the reader to identify with her as an average person and makes it totally believable. I’ve personally never read any of Julia Child’s cookbooks and I’ve never seen her on TV (although I do know who she is). I actually found myself laughing out loud at some of Julie’s descriptions of her cooking situations; she wrote honestly and candidly and it doesn’t hurt to throw some curse words in there too for emphasis (even though I guess a lot of people didn’t like that). 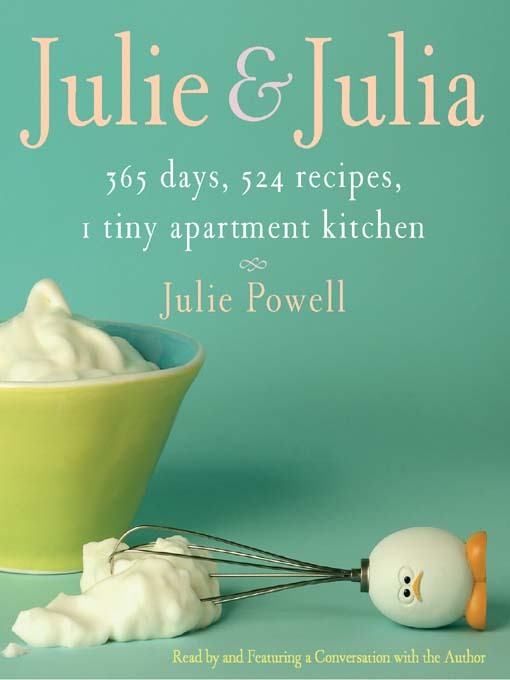 I found what appears to be her original blog: The Julie/Julia Project and plan on reading through it to get a better feel for what she really went through during that year of cooking. Her adventure of blogging back before it was popular was also inspiring. One thing that I wasn’t crazy about was the incorporation of Julia Child herself into the book; the letters/journal from her husband seemed a little detached from the story and I found myself skimming over those parts pretty quickly. I wonder if that was different in the movie; in the previews, it seemed like Meryl Streep was incorporated more into the movie. I would have liked to see more detail about Julia Child’s life and experiences. That was touched on in certain parts, but I didn’t really learn anything new about her that I hadn’t known before. I’d recommend this book for anyone who likes a fun, easy read, and if you like to cook, I’m sure that’s a plus (I didn’t understand some of the cooking terminology but that’s not important to the actual story). However, I don’t think I’d like to actually eat any of the recipes that she made… most of them sounded pretty gross but apparently tasted better than they looked. I found another book by Julie Powell called “Cleaving: A Story of Marriage, Meat, and Obsession” which is a follow-up to “Julie and Julia” that focuses on Julie’s new hobby/obsession of butchery. The reviews on Amazon aren’t very good but I might give it a read anyway.